These activity assortments come complete with some more advanced essentials for students in middle school. 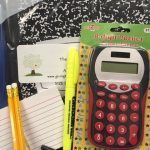 These items such as a calculator and a protractor, help students thrive in their classrooms as they learn more new concepts. Include a note of good wishes in your bag to send happy thoughts to these underprivileged students as they continue on their journey towards high school.